The Blue No. 1 dress seen here is the best uniform and worn on ceremonial occasions. 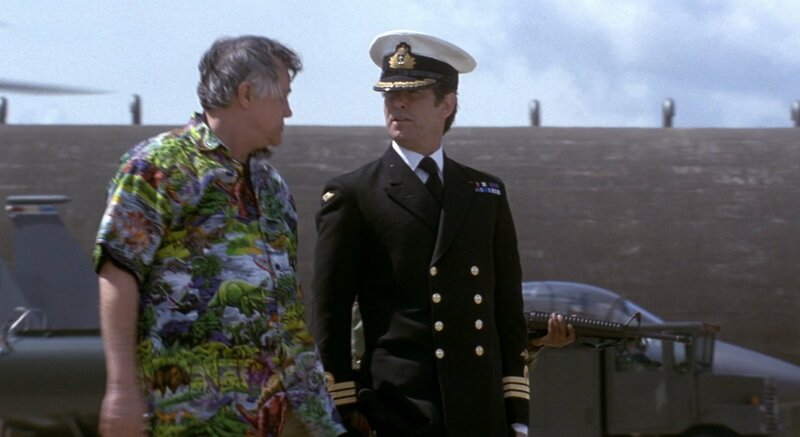 Bond wears this officer’s uniform for briefings in You Only Live Twice, The Spy Who Loved Me and Tomorrow Never Dies. The colour of the wool is a true navy, which almost looks black. The jacket is an eight-button double breasted with four to button, and the gilt buttons have a crown and anchor motif. The double-breasted lapels have a buttonhole in each peak. The jacket has jetted pockets, short double vents, and the rank insignia of commander on the sleeve, consisting of three rings of gold braid with the executive curl in the upper braid. The style of the trousers can vary, but often they are made with traditional forward pleats. They may have side adjusters, a self-belt, braces or some other method of holding them up. 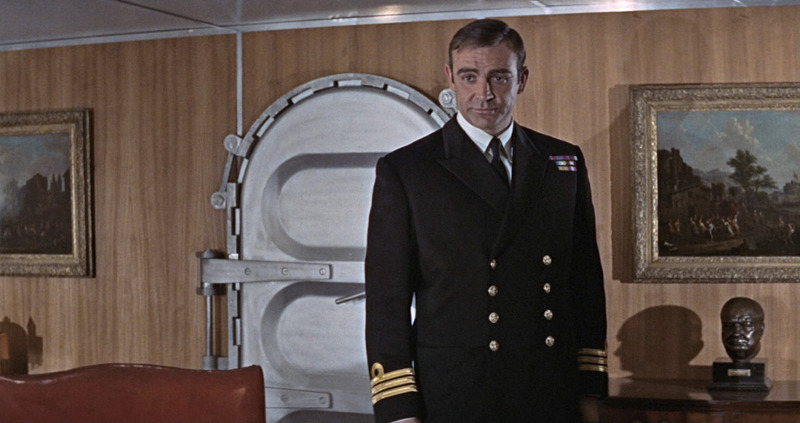 Sean Connery’s uniform trousers in You Only Live Twice are cut with a high waist, double forward pleats and and worn with narrow, dark braces buttoned to the outside of the waistband in front. Officers’ dress uniforms are typically made by bespoke tailors who specialize in military cuts. A British military cut has strong, padded shoulders (often with roped sleeve heads), a clean chest and a long skirt. 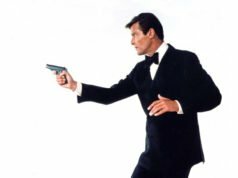 Sean Connery and Roger Moore likely did not have their tailors—Anthony Sinclair and Angelo Roma, respectively—make their uniforms because the former did a softer cut and the latter did an Italian cut. It’s possible that costumers Bermans & Nathans made the uniforms. 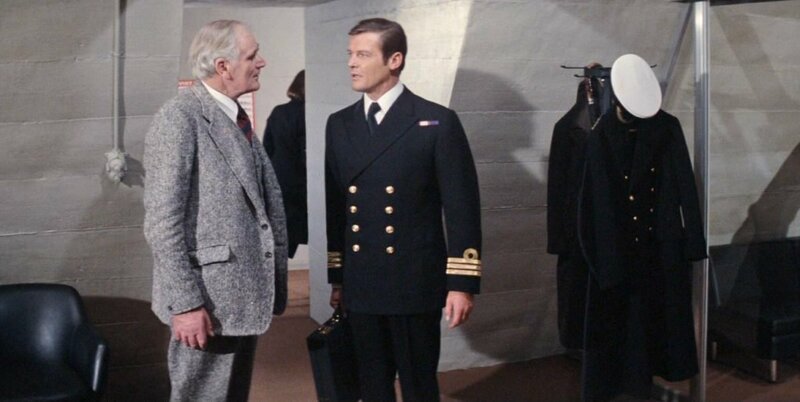 Bermans & Nathans made other naval wear for Moore in The Spy Who Loved Me. Both Connery’s and Moore’s uniform coats have an English military cut with a straight shoulders, roped sleeve heads, a clean chest and a suppressed waist. The British costumer Angel’s (successor to Bermans & Nathans) made Brosnan’s uniform, since having the Italian Brioni make a British naval uniform would be out of place. Brosnan’s uniform has a closer fit than his Brioni suits in Tomorrow Never Dies have. Connery’s white shirt has a point collar and double cuffs and Brosnan’s shirt has a semi-spread collar and button cuffs. Moore’s ecru shirt—most likely made by his shirtmaker Frank Foster—has a point collar (with a large amount of tie space) but his jacket sleeves are too long and the shirt cuffs are not seen. They wear solid black silk repp ties in a four-in-hand knot. The shoes are shined black leather derbies. A peaked cap with a white crown accompanies the three uniforms. There is a publicity shot of Sir Roger in RN dress which shows barrel cuffs but we cannot tell whether they are of the tab design or not. Strangely enough he has a 1675 pepsi Rolex GMT-Master and not a Seiko on the picture but that is another subject. This is an excellent post. Does anyone know what the service ribbons mean? Sorry Christian, I have no idea. An expert on military uniforms might know, thought it still might be hard to tell until these movies are released on Blu-Ray. Not saying it's right, but I rarely if ever see military uniforms that show shirt cuff, whether they are British, American or anything else. Amazing how that uniform hadn't changed in almost 30 years. Single cuffs are worn with cufflinks but do not fold. They are more formal than double (French) cuffs. I assume this is the only time Bond wears single cuffs??? I am positive that Pierce Brosnan is not wearing a RN Officer’s cap. It looks like a Senior Rates cap with an officers badge on it…. Please contact the producer of James Bond movies (Barbara Brocoli), and ask her to give the NCIS actor, Michael Weatherly, an opportunity to be the next James Bond. Mr. Weatherly has the exact style of Roger Moore, so would be very exciting and much more attractive than the current actor . Please give this request full consideration. 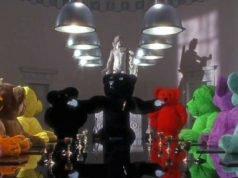 It would be a real money maker for the Bond series. Thank you. I had to google him, looks like an all-American Brad Cheeseburger, penny-a-dozen primetime tv fodder. Not a bad looking guy, per-se, but just so typical of a tv actor and slightly doofy looking, like Brendan Frazer. Also, born in 1968, so similar age to Craig. Not going to happen pal, I can assure you. I bet lots of people bombard the executives with suggestions for their favourite actors. James Bond has to be tough, but also have elan and grace. Henry Cavill looks the part, but is too well-known. It will probably been some barely known actor. Since Craig restored a raw physicality to the role (unseen since Connery) I do not think that Pierce Brosnan types will get another chance. The ideal candidate would have the look, charm and build of Connery, the wit and class of Moore, the cold-blooded cynicism of Dalton and the je ne sais qoi appeal of rough-faced everyman Craig. I don’t think this guy exudes any of these qualities. Is it de rigeur to bottom the last button on a double breasted suit when it is a military suit? Yes. I’m not a military man, but I might imagine it’s required. I bumped into this photo, it appears Connery wore braces with his naval uniform. You mentioned in the final paragraph that Moore’s jacket sleeves are too long and that no shirt cuff is displayed. Most military uniform regulations do not allow for the showing of shirt cuffs as is typically seen in regular formalwear. It’s most often seen in period photographs of WWII in which a large number of people were pressed into service and they were able to show their “individuality” in the crowd by having slight variations in their uniform.